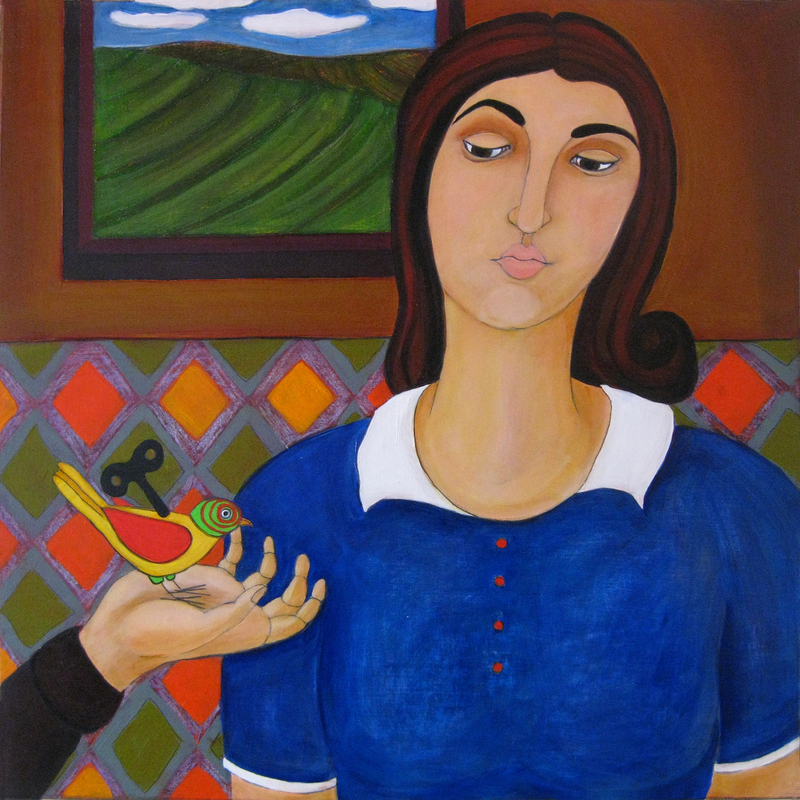 The Gift, oil on wood, 24" x 24"
I grew up in a small town in Connecticut and moved to Philadelphia to attend the University of the Arts where I earned a BFA in Painting and Masters in Art Teaching. Taking a mid-way break from school, I traveled Europe, settled in Italy where I lived and studied for two years. After college, I maintained a studio on the Italian Market in Philadelphia for over twenty years. My current studio is in the SoHA Arts Building in Haddon Township, New Jersey. I have taught art in both public and private schools and now teach at SoHA. I live in New Jersey with my family. Making a painting is like opening your junk drawer and organizing it. Everything I love is in that drawer. Birds, flowers, bugs, color, line, form and I have to make sense of it. I have to throw out what I don’t need and make sure what I keep is worthy of the real-estate. Making a painting is like having a curio cabinet perfectly arranged with small vignettes. I have to let things move around before settling down into a permeant place. Every painter will tell you it is all about relationships, how color and form play off each other. But it is also about the dance, finding the right partner that zigs to your zag. When it works it works and you shut the cabinet door quick before you start messing with it. Making a painting is like revealing the understory of a rainforest. It is what you don’t see right away that makes a good narrative. Yes, flowers are beautiful, but so are the bugs in the vase and the awkward way the bloom bends and the quirky drawing. Sometimes it is not the main event, but the side show that shines. A moment that is just slightly off kilter and makes you tilt your head and say “hum?’. Making a painting is like setting a table. I am going to have a lot of color and pattern. I obsessively make marks, sand them away, and make more marks leaving a trail of pattern over color over pattern. It is like setting a table every day and leaving a trail of crumbs. I can never remember which side the knife goes on and to tell you the truth, I don’t care. Making a painting is a lot like a child’s game of telephone. I head out with a clear direction and have no idea where I will end up. What starts off green may end up being red. I am determined to make a “quiet” painting and find myself squeezing out a blob of cadmium orange. I am not precious about things. I work on no less than three paintings at a time because I know all to well one will have to die. This process is my addiction. It is like chasing fairy dust. I love it. Currently teaching art at SoHa Arts, Haddon Township, NJ. For more information and class schedule go to SoHaArtsBuilding.org and Facebook.com/MariaChristopherArt. Images may not be reproduced or used without permission.